At the crossroads of King and Punchbowl Streets, in downtown Honolulu, stands historic Kawaiahao Church, the "Westminster Abbey of the Pacific." It is as famous a landmark in Hawaii as lolani Palace, the home of royalty, which stands in regal beauty a short distance away. The present church, a coral block building, was erected in 1842 and has stood in its present condition of majestic grandeur to this day. But the tradition of Kawaiahao is traced to April 25, 1820, when the Reverent Hiram Bingham of the First Company of Missionaries, conducted the first Christian service on these same grounds to a handful of native Hawaiians. Though it was the Easter season, the Reverend Bingham chose as his text the story of Christmas. Following the first service, the word spread and the new faith was adopted by many of the natives. It is recorded that at subsequent services as many as four thousand worshippers crowded the small area to hear the words brought to them from the craggy coasts of New England. The Hawaiians, with their great love of music, embraced the hymns of the Calvinists, embellishing them with the reverence and "Aloha" of a simple, all-loving faith. A choir was formed and has continued for a century and a half, a golden link between America's 50th State and the heroic Kingdom of ancient Hawaii. The selections sung on this album are among the most requested hymns and anthems in the Choir's repertoire. The Reverend Lorenzo Lyons arrived in the Waimea district of the island of Hawaii in 1832 and devoted the remaining 54 years of his life to church and social work among the Hawaiians of the district. He was called Ka Makua Laiana, the "Poet of the Mountains," by his parishioners, for he lived on the slopes of mighty Mauna Kea and early learned the language of his adopted land. The Reverend Lyons composed many original poems and hymns, but his translation of the hymn, "I Left It All With Jesus" (Hawaii Aloha), is his most famous work. The hymn is traditionally sung at solemn occasions, and most Hawaiians still stand during its presentation. Charles E. King is considered to be the foremost of all Hawaiian composers. A member of the first graduating class of the Kamehameha School for Boys, he is noted for his creation of original songs, and wrote both words and music. Among his compositions, "Beautiful Kahana" extols the scenic wonders and languid life of the rural area on Oahu's Windward Side. One of Hawaii's best-known homes was the Ward Estate on King Street and Kapiolani Boulevard, at the outskirts of downtown Honolulu. Built in the form of a Southern mansion and enclosed on four sides by a ten-foot fence, it was aptly named "Old Plantation." The song, written by David Nape, a member of the Royal Hawaiian Band, is reminiscent of Stephen Foster, but totally Hawaiian in concept and construction. The lyric, in true poetic style, tells of the plantation's old water wheel and likens it to the charm of old Hawaii. 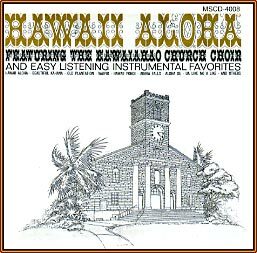 One of the Choir's most revered numbers, this selection is typical of the traditional Calvinish/ Anglican hymns translated and modified into a Hawaiian hymn. Often mistaken as a song about the fabled valley on the Hamakua coast of Hawaii, "Waipio" tells of the flowers which graced the home of Mrs. Irene Kahalelaukoa Holloway on the island of Oahu. The composer, Mekia Kealakai, was bandmaster of the Royal Hawaiian Band. The melody is only eight bars in length, but is among the most haunting in all island music. Liliuokalani, the last monarch of Hawaii, was Queen for only two years. An insurrection in January of 1893 dealt a death blow to the Kingdom of Hawaii. The monarchy was overthrown and the Provisional Government was proclaimed. "Composed during my imprisonment by the Missionary party who overthrew my government, lolani Palace, March 22nd, 1895." Also written on the music sheet is the title she selected, "Liliuokalani's Prayer, Ke Aloha O Ka Hau," but the hymn is known today throughout the islands as "The Queen's Prayer." In 1874, King David Kalakaua disappointed with the anthem of the Kingdom, wrote a brief lyric of eight lines and directed Henry Berger, bandmaster of the Royal Hawaiian Band, to set the words to music. The bandmaster, calling upon his early training in the German army, composed a ringing air of high emotional pitch. The result, "Hawaii Ponoi," was an instant success and became successively, the official anthem of the Kingdom, the Republic, and Territory and, finally, the State of Hawaii. The Kawaiahao Church Choir here presents the anthem as it was sung during Kalakaua's reign. The Falls, located near Honomu on the island of Hawaii, has always been one of Hawaii's most spectacular scenic attractions. The song, composed in 1925 by Helen Parker, tells of the visitor's first view of the tumbling waters, the beauty of the descent and the cooling spray's myriad colors as the sunlight bathes the scene. Next to his love of family and the land, the true Hawaiian's deepest feeling are for the flowers of his beloved islands. Among the most popular of Hawaiian melodies celebrating the fragrance and beauty of individual blossoms are these two Charles E. King compositions, presented in medley form. The Hollywood film, "Bird of Paradise," was distinguished by a song performed midway through the movie by Debra Paget. It captures the true spirit of Island music and is now one of Hawaii's favorites, sung and danced at festive occasions. Freely translated as "Sweet Constancy" or "My Heart's Choice," this love song rivals the more familiar "Ke Kali Nei Au" as a choice at weddings and anniversaries. Many song books of Hawaii credit Charles E. King as the author, but it is generally believed that the composer was a young girl, Alice Everett, who wrote it in 1895. The most famous of all Hawaiian songs, "Aloha Oe" was composed by Princess Liliuokalani during the reign of her brother, Kalakaua. She had spent the day in Maunawili on Oahu's Windward Side and was returning on horseback over the old Pali Road. As she rode she hummed the strains of an old hymn, "The Lone Rock by the Sea." When she reached Washington Place, the official residence of royalty, she summoned a guitarist and the musical phrases, some old, some new, were set down in manuscript form. That evening, Liliuokalani wrote the lyric. Three years later in San Francisco, the song was performed by the Royal Hawaiian Band. It captured the imagination of the world and has remained from that day the melody most readily identified with Hawaii.